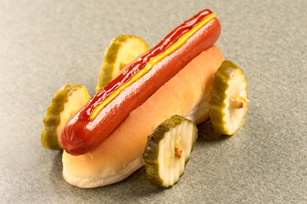 Turn a hot dog into a hot rod with pickle wheels and ketchup-and-mustard racing stripes—and don't listen to anyone who says this recipe is just for kids. Heat frank as directed on package; place in bun. Gently insert 1 pretzel stick, 1 inch from each end of bun, through both bun and frank for each tire axle, leaving both ends of each pretzel exposed. Attach pickles to ends of pretzels for the wheels. Use ketchup and mustard to add racing stripes. For children under 4, cut hot dogs lengthwise and crosswise into small bite-size pieces. Children should always be seated and supervised while eating. Substitute thick cucumber slices for the pickle chips. Make headlights by cutting a green olive crosswise in half. Attach to front of car with an additional pretzel stick, broken in half.